Organisers Gold Media and Events are pleased to announce that Emmanuelle Caplette will perform on the International Main Stage at The UK Drum Show on September 23rd at Manchester Central. 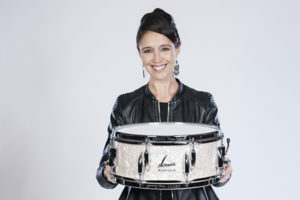 Emmanuelle joins drum legends Thomas Lang, Dennis Chambers and JR Robinson on the Saturday, with Stevie Wonder’s drummer Stanley Randolph and Craig Blundell & Michael Schack, plus two further huge names to conclude the Sunday line-up being announced shortly. ‘There is a huge list of exhibitors which will not disappoint visitors, with further exhibits to be announced shortly,’ plus in my 7 years of running drum events, a lineup of artists unparalleled to anything that has ever been achieved before, which is more luck than skill, due to artist availability,’ states Golding, show organiser. For any company considering one of the last few stands, should contact Gold Media and Events to be part of this debut national show. The post Super Saturday line-up complete for The UK Drum Show appeared first on Music Instrument News.